Berry Happy 3rd of July! The poppers consists of a Flour Creations Shortcake, topped with a layer of strawberries from Orchard or Ortiz Farms then followed by whipped cream also from Flour Creations and finished off with Blueberries from Sebastopol Berry Farm. Bring Your Own Container (glass recommended) and it’s only $1 an oz. Playing with your food in a good way. Bento (弁当, bentō?) is a single-portion takeout or home-packed meal common in Japanese cuisine. A traditional bento consists of rice, fish or meat, and one or more pickled or cooked vegetables, usually in a box-shaped container. Containers range from disposable mass produced to hand crafted lacquerware. Although bento are readily available in many places throughout Japan, including convenience stores, bento shops (弁当屋, bentō-ya? ), train stations, and department stores, it is still common for Japanese homemakers to spend time and energy for their spouse, child, or themselves producing a carefully prepared lunch box. Bento can be very elaborately arranged in a style called kyaraben or “character bento”. Kyaraben is typically decorated to look like popular Japanese cartoon characters (anime), characters from comic books (manga), or video game characters. Another popular bento style is “oekakiben” or “picture bento”, which is decorated to look like people, animals, buildings and monuments, or items such as flowers and plants. Contests are often held where bento arrangers compete for the most aesthetically pleasing arrangements. Locally Sonoma Bento practices Kyaraben. It’s particularly fun for children’s lunch boxes or just to brighten up the lunch of anyone who is brown-bagging. “Sonoma Bento, locally sourced and farm fresh, bento box ideas that are just plain fun. 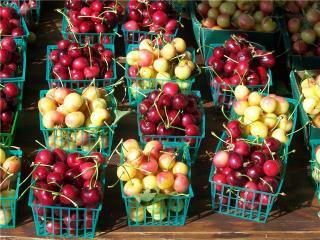 No matter what the calendar might say, it is summer time at the market. Field grown cucumber, peppers and from the Rhodes Family Farm – tomatoes. 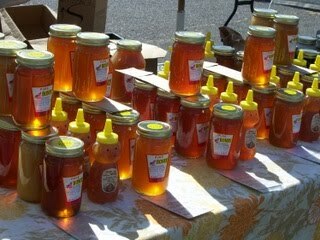 Rhodes Family Farm is only at the Wednesday market. Purple and White mulberries, white figs and even the first field grown tomatoes. Photos by Charlotte Quick-Paris market regular and wonderful recorder of market life. Farmers planting strawberries and other crops in California will soon have to contend with cancer-causing poison instead of bugs, worms and fungus if regulators get their wish. The California Department of Pesticide Regulation has proposed registering methyl iodide as a pesticide in California to the dismay of scientists and environmental groups, who say it is so toxic that even chemists are reluctant to handle it. The chemical will become legal for growers to use after a 60-day comment period ending June 29 unless there is some kind of public outcry. Just say no to methyl iodide. Make sure the vendors know you support saying no to methyl iodide. 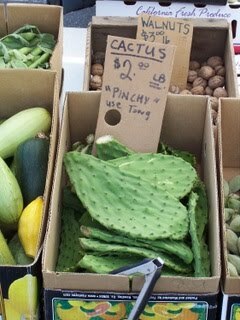 Currently no vendors at the Santa Rosa Market are using this toxic poison.